up until 1991, islay children were taught to swim in the sea during the summer months because the island had no swimming pool. not being able to swim is somewhat of a disadvantage for those living on an island, given that the bulk of travel to and from scotland is by ferry. after much campaigning and fund-raising, a group of concerned locals, aided by the generosity of bowmore distillery in gifting one of their disused warehouses, managed to have a particularly fine, but still somewhat underfunded swimming pool/leisure centre constructed in the centre of the village. i bring this to your attention because i have spent a reasonable portion of my day scanning and processing photographs of many kids who gained swimming certificates in 1986; 25 years ago. before i even moved to the island. after a vehicle accident in the early nineties in which i was an innocent, but injured passenger, i'd to refrain from swimming for a number of years, and i've never gone back. if i'm quite honest, i was never much into it in the first place; too boring, and not much to see apart from water. if time allows, i'd far rather be out on my bicycle where there is a great deal more to see. but in the days when i did go splashing about in the water, i wore apparel suitable for the purpose; you wouldn't, for instance, go swimming in a pair of levis and a berghaus jacket (would you?). therefore, much the same applies to the act of cycling, in my humble opinion, where the clothing available is there for very good reason, one that includes making a bike ride as comfortable as possible. bibshorts, bibtights, overshoes, merino baselayers, jerseys with three back pockets, all have been developed over the years to a high state of refinement making us almost as efficient as our bicycles. but what of those who prefer to be folks with bikes, rather than rouleurs and grimpeurs, where do they fit in? well, fortunately, many's the company now offering regular looking apparel that bears nearly all the efficiency of that landbouwkrediet team kit. what seems to have been often overlooked, or perhaps just minimised by design constraints, is storage space; where do you put stuff? it's funny you should ask that. kyle mosholder pretty much single-handedly operates brooklyn-based d'emploi, manufacturing entirely by hand, a wide variety of all but essential cycle artifacts, such as rucksacks, belt bags, top tube flannels, t-shirts, and thermal baselayers. these are all built with the sole aid of a singer sewing machine. but which came first, the sewing machine, or the need for one? "i had been using a less manly machine for some time and knew that what was missing was the consistency of something industrial.Ê i had no way of knowing that it would come one random day, or that it would be as young as my grandfather.Ê that day i went to see another machine and fell in love with this one.Ê yes, i love the old singer." the cycle world, however, has much more in common these days with technological advance, whether it be nano-fibres in the carbon, or micro-fibres in the polyester. the notion of producing goods the old fashioned way is all but anathema; all cut from the same die is seemingly the way to go. but the more that technology heads in this direction, the more some of us ache for the days of old when stuff was made by craftsmen, and not everything had the same standard patina, sheen or stitching. was kyle making a conscious attempt to restore the heyday of the hand-made product, with a mission to instil a bit of pride in that hand-made in america tag? "definitely.Ê iÕm no nationalist, but i feel a real aesthetic connection to objects and apparel from the first half of the 20th century.Ê so many things in the world are 'hand-made' but with such precision it never crosses the minds of most.Ê however, though i strive for quality and consistency, i thrive on seeing slightly shifty stitching.Ê knowing that someone was so focused (or not), in that moment, on what they were doing.Ê really, i just want everyone to take pride in how they do their thing." 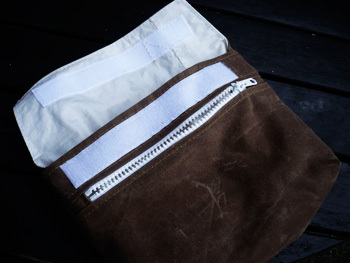 the proof, as they say, is in the pudding, and kyle was kind enough to send over one of his hand-made belt bags hand-sewn and lined by his own fair hand, substantially built from water-resistant waxed canvas sourced from a new jersey fabric mill and with sailcloth lining from new york city. 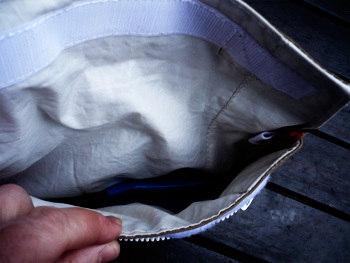 this consists of a large, main pocket with a flap fastened by good old hook and loop just above a ykk zip sealing a secondary pocket on the front. 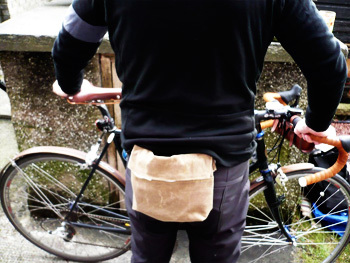 the back features two loops to fit on a belt as well as a u-lock sling doubling as a handle when wandering about off the bike and off the belt. the crowning glory is a hand embroidered d'emploi logo sewn into one of the side seams. its rustic good looks owe as much to the overall design as they do to kyle's workmanship. what i wanted to know was how hard it had been to source home-made materials for use in d'emploi products. was that difficult to do? 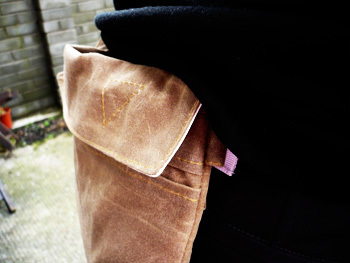 my own use of the d'emploi belt bag came at a fortuitous moment; the day after the bag arrived from new york. i'd to cycle out to one of the island's farms and carry out some investigative broadband works on an apple macintosh. don't get me wrong, there are things i can manage when it comes to modern telecommunications, and lots more that leave me standing, but it ill-behoves me to leave a fellow macintosh user stranded. this is not something i do on a regular basis. a part of the problem portended to be the inability of a small boy to download apps to play on his ipod, so i had need of my own ipod, and since, weather permitting, there would be a following trip to the mighty dave t's involving gear cables, it was necessary to take along cable cutters, crimpers and those little cable ends that it is incredibly easy to lose. en-route, lunch would be obligatory, so i needed to take some money, and given that i ride wearing my rudy projects, i'd to take along my regular spectacles so as not to look too much of a prat in front of a computer screen. all the above fitted comfortably and securely into the d'emploi belt bag, meaning i had no need to dress like larry, bertie or andy to carry out the tasks in hand. and, d'you know, wearing just such an appendage about one's person is not only all but unnoticeable from the saddle, but adds a soupcon of je ne sais quoi to one's stature and well-being. did kyle have to train himself to use that singer sewing machine to end up with such fine craftsmanship, and is it the sole example in the d'emploi empire? "i am a sculptor in mostly metals, by training.Ê i had used a sewing machine for art purposes many times, but probably not 'productively'.Ê so when i started getting serious, the quality of the craft and tools became the key to that.Ê and indeed lately, being productive involves pushing what i know and can conceive of in my mind when figuring out a new bag (at least two new ones coming this spring! ).ÊÊitÕs both the mind and the machine, the hands are just the go-between. 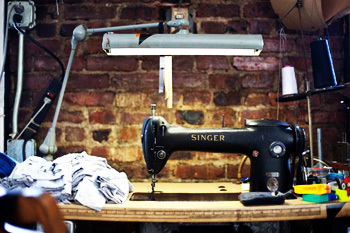 "as to the sewing machines, you probably have more than one bike, but when it comes down to it, you know which one is right for the job.Ê for the heavy canvas goods, itÕs my singer 241-2.Ê i also have two machines that allow me to make t-shirts and another 'home' machine for finer work.Ê gotta have an arsenal..."
though my belt-bag has become all but indispensible when riding dressed as a normal human being, it strikes me that many of kyle's output would also suit activities other than those involving two wheels and a chainset. so is he specifically targeting the cycle market, or is the net being cast wider than that? "cycling is what i know.Êthe idea with the word dÕemploi (french for employment, or 'of employment') is considering how you spend your time.Ê how one trades time for money, fun, etc.Ê i have started by sticking close to what i know and what i already do.Êin working with others, i have begun other paths to make functional items for different pursuits.Ê photography being a big one right now, expect a badass photopack to pop up in the near future.Ê mostly, i am happy to use this endeavor to work with otherÕs ideas and needs.Ê functionality and applicability are what drives this thing; 'fashion' just messes it all up." the belt bag as reviewed costs only $40 (around £25), and kyle is more than happy to send products to the four corners of the world as well as the usa. it's not often that it's possible to own something hand-made in brooklyn, new york, more especially when that something has character infused in the very fabric of its being. take a look through the online catalogue to see for yourself, but nothing really compares to holding one (or more) in your hand. a sense of tradition well worth participating in.